We are thankful for each community supporter who joins in our mission by supporting our events- whether through a sponsorship, volunteering, or attending! Proceeds from each event benefit Ascension Providence’s mission of serving all persons within Central Texas. Providence Foundation holds two major fundraisers each year. 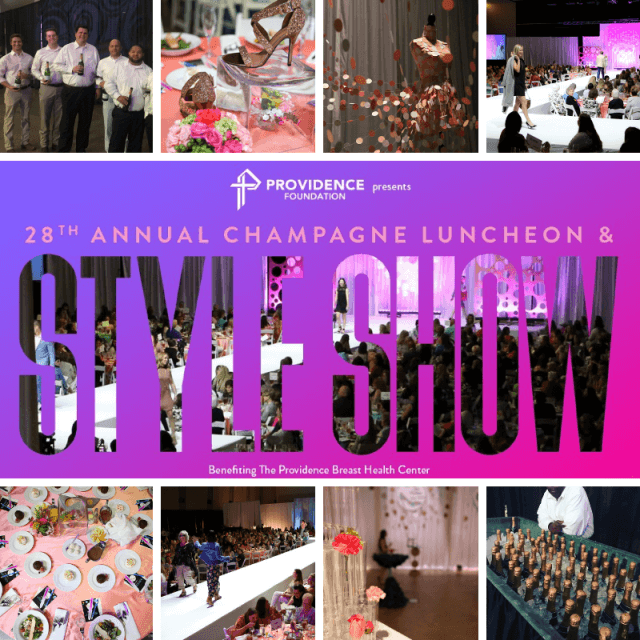 In the spring, Providence Foundation hosts the Providence Champagne Luncheon & Style Show. In the fall, Providence Foundation hosts the Providence Golf Classic. The Providence Gala is held every 5 years; the next Gala will be held in 2020. Further details are below. Contact Paige.Corley@ascension.org or 254.751.4717 to learn more. The 2019 Providence Golf Classic will be held on Friday, October 11 at Cottonwood Creek Golf Course. Pick your tee time- 8:00 am or 1:30 pm- and join over 150 golfers for a day of fun on the course while supporting advancing healthcare for our community. Sponsorships are available to promote your business, and individuals teams are available. Sponsorships vary in business recognition, and all come with players in the tournament. Breakfast, lunch, snacks, beverages, various contest holes, & 1st, 7th, and 15th place winners are part of the tournament. The Gala will be held every 5 years as a celebration of Providence’s history! The Gala will be held in spring/summer of 2020- stay tuned for more details! What’s going to be the newest fashion trends for spring and summer? Join us in 2021 to find out! The latest fashions will be brought to you by Waco’s local boutiques and elite department stores. Showcased will be everything from elegant evening gowns and suits for the next big Waco event, after 5 night-on-the town fashions, business attire, fun-casual outfits, clothing for your next beach vacation, and those oh-so-comfortable-but-cute outfits for your lounge days! You’ll know exactly where to find your favorite styles after this show! Since its inception, Providence Foundation has awarded over $20 million in grants to deserving departments within Ascension Providence.